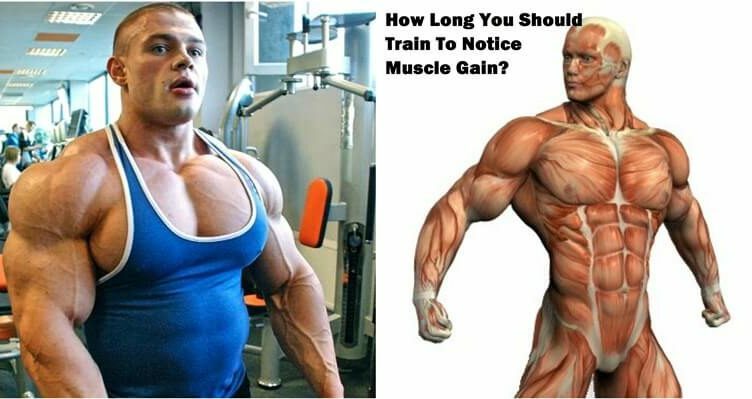 Home Muscle Building How Long You Should Train To Notice Muscle Gain? After people realize their fitness goals, they often become curious about how long it’ll take to achieve their goals. However, there are many different people, and they want to succeed in different areas. So, how long it takes to achieve something depends on many factors. To make it easier to work towards your fitness goal, it’s important to know what you want to achieve. For instance, your goal might be to lose weight, build muscle mass, or completely transform your body. If you already know which one of these you want to accomplish, then it becomes much easier to calculate the amount of time it’ll take to complete it. So there is the question how long you should train to notice muscle gain? By using natural methods, you can grow about two pounds of muscle mass every month. If it’s the first time you build muscle mass, then you might be able to grow a bit more than two pounds of muscle mass per month. However, be aware that some of this weight will be body fat, so don’t be surprised that after a long-term bulking phase you’ll need to cut some pounds of body fat. If your bodyweight increases too fast, there is a huge chance you grow an excess amount of body fat. You can avoid it by decreasing the number of calories you eat or by burning more calories by increasing the amount of time you exercise. If your bodyweight doesn’t increase, make sure eat at least 300 additional calories. If it doesn’t help, then gradually increase the number of calories you eat until you’ll be able to grow two pounds per month. For most people, losing weight takes less time than growing muscle mass. This is because people can usually decrease the amount of body fat they have by one or two pounds every week. So, it takes just a tiny amount of time if we compare it to the amount of time people need to spend to grow muscle mass. On the other hand, decreasing your body weight by more than two pounds per week might not only result in losing quite a lot of muscle mass but by causing liver issues, gallstones, and loose skin. If you have a highly specific goal like to build 30 pounds of lean muscle mass, then it’s even easier to calculate the amount of time you’ll need to complete it. For instance, if you’ll be capable of growing as much as two pounds every month, then it will take 15 months to grow 30 pounds. However, you should remember that you might be able to grow a little bit less than two pounds every month. Also, you should keep in mind that you’ll not only grow muscle mass but also body fat and that it’ll take some time to lose that body fat to look lean and muscular.